Many of today’s top business books recommend empowering employees by giving them the space required to solve the challenges with which they have been presented. The micromanaging, ‘do as I say’ boss of the past has been replaced in favor of a coaching model that places more value on the ‘what’ (results), versus demanding the ‘how’ (process). A few buyers of contingent labor are still stuck in that outdated mindset, thinking the micromanagement of their staffing partners with singular focus on their ‘how’ (mark-up) will, in return, drive the biggest value back to their companies. The issue here is that consultant benefits are included in those ‘mark-ups’ – so staffing companies have been compromising their benefit offerings for years to meet the ‘mark-up’ requirements and remain profitable. (See also: Why Most Recruiting Company Benefits Stink). The most open-minded and forward-thinking buyers of contingent labor now drive value to their companies by using fixed bill rates and increased competition vs. using a fixed mark-up. Talent Acquisition professionals demand the absolute best candidate for the job. Increasingly, they are relying on the ability of their staffing partners to apply the given bill rate in a way that provides a custom compensation model and the right mix of benefits, so top candidates say ‘yes’ to their offers and stay on the project as long as required. When implementing a fixed bill rate model, competition is critical. 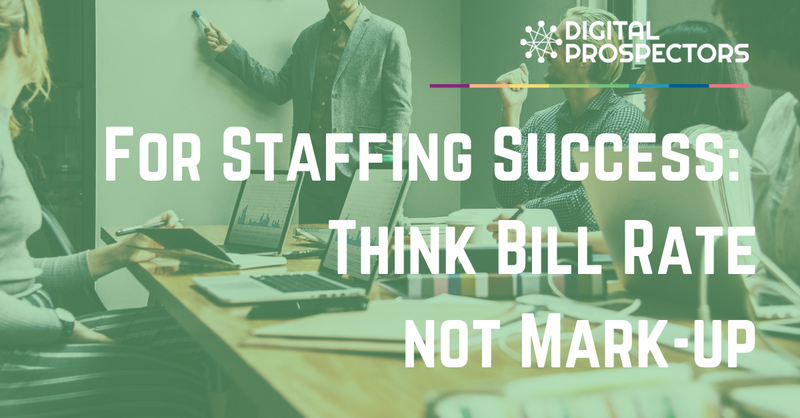 Hiring companies will always want at least three primary staffing partners competing for their business – and often times more than three depending on the size of the program. Healthy competition brings out the best in the staffing agencies and leads to better overall results for the client. By engaging multiple staffing partners with standardized hourly bill rates, clients know they are getting the best available talent on the market for the price they are willing to pay. With agencies unconstrained by mark-ups they are free to do their jobs creatively and attract the best talent available for their clients’ needs.